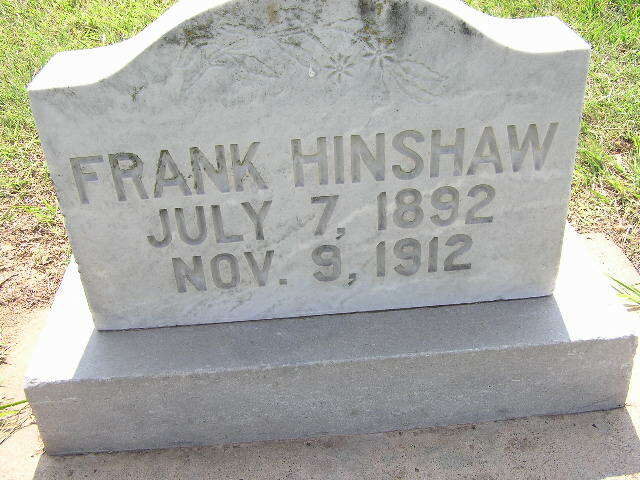 Joel Frank Hinshaw1 [Frank Hinshaw2,3,4]. Born Jul 7 18923 [Jul - 18911,4,5,6], Missouri3. Hinshaw, Frank, lodger, age 19, born in Missouri; father born in Kentucky; mother born in Texas; single; occupation: hostler, private stable. Frank Henshaw, who joined the U.S. Army a few months since, died of spinal meningitis at Ft. Gibson, Colo., Saturday and was not learned at press hour where he will be buried. Contribution from Mary Lou Hinshaw Malcomson. 1910 census, 1st Ward, Walla Walla, Walla Walla County, Washington; roll T624-1673, ED 245, page 5B, line #92, dwelling #257, family #184. 1900 census, East Center Township, Greene County, Missouri; ED 47, page 75A, line #27, dwelling #235, family #235.